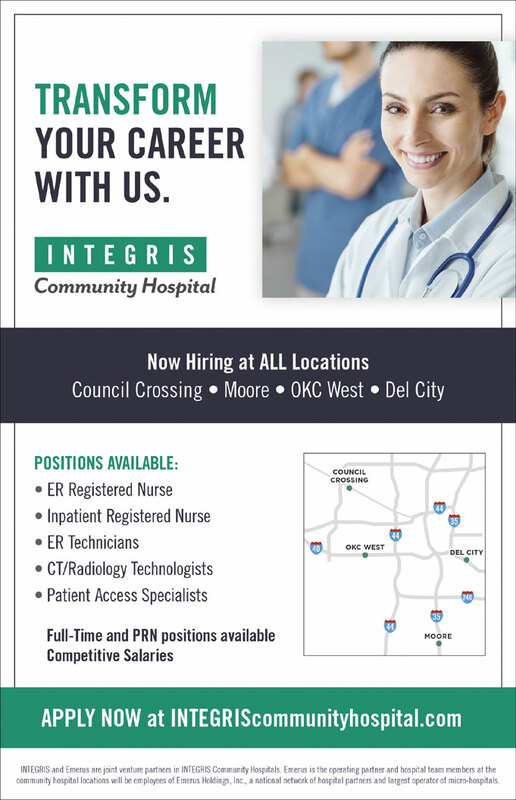 University of Central Oklahoma grad Claire Creecy, RN, BSN, is a surgical circulator for Integris Edmond. 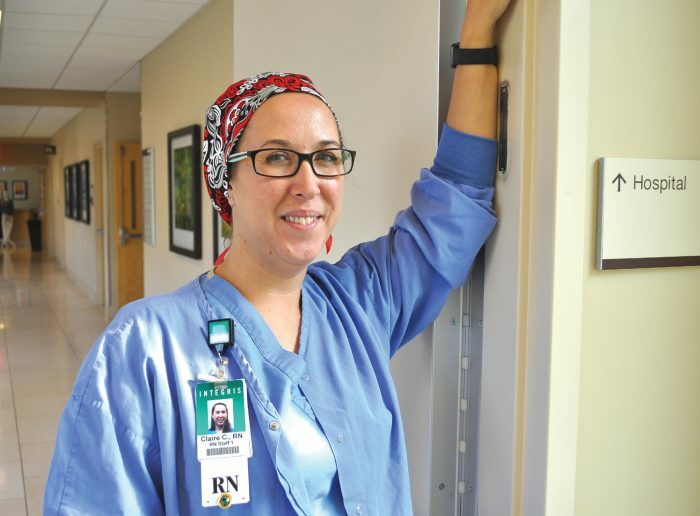 More than a decade went by before Claire Creecy, RN, BSN, truly understood her passion. It was somewhere during the time Creecy’s husband was pursuing his master’s degree that something made Creecy want to go back to school. And not just any school. She decided nursing school would be her next step. Nursing was career No. 2 for Creecy, who worked at a veterinary clinic for eight years as an office manager. With a couple years experience as a scrub tech Creecy felt a calling back to the hospital setting. And nearly two years after graduation and countless hours in the ORs at Integris Edmond, Creecy can finally say she’s happy getting up and going to work every morning. Creecy has heard the old joke that surgical nurses choose the operating suite because they prefer their patients sedated. Going back to school was a challenge. Two young kids, working a full-time job and going back for a second bachelor’s degree meant Creecy was burning both ends of the candle. The first semester almost did her in. Knowing she wouldn’t see her kids for days at a time was rough. But she pushed through. It got easier along the way. 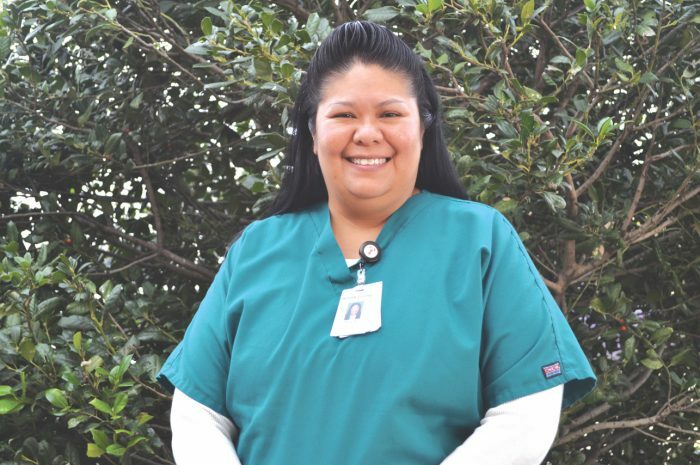 Creecy’s two young children and a husband who teaches in the forensic science department at UCO made her want stay close to home for her first nursing job. “I did my clinicals with Integris and really enjoyed it just the structure and the feel about it and wanted to come back,” she said. Finding a day shift position was also paramount. And something about working in a facility nestled just off the highway on 44 acres filled with hills and trees just seemed right. Creecy’s five-year plan includes staying right where she is. Last June Integris announced its plan to more than double the size of the hospital to include 64 new inpatient beds. The expansion will take the existing hospital up to five stories at the 4801 Integris Parkway location. More than 143,000 square feet of additional place is planned in three different sections of the hospital giving the facility some 304,000 square feet of total space. Integris Edmond currently operates 40 inpatient beds with 24 surgical rooms. It’s where Creecy comes to feel whole. And the process has benefited the whole family. Seeing their dad earn his PhD and then mom going back to school to become a nurse has given the Creecy children an invaluable life lesson. Most Oklahomans are aware that registered nurses are in high workforce demand in Oklahoma and the nation. RNs are at the top of the list of the state’s “critical occupations” according to Oklahoma Works. What isn’t as well known is while there is high demand for all RNs, increasingly hospitals, clinics and other health organizations have acute shortages of baccalaureate-trained nurses. 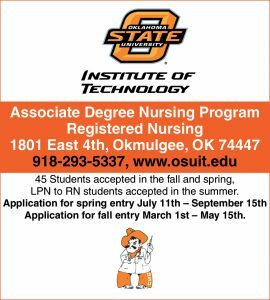 The Oklahoma Nurses Association has long been a supporter of registered nurses with a bachelor of science in nursing (BSN). Only 44 percent of the RN workforce holds a BSN. A report on the nursing shortage by the Governor’s Workforce Council provides strong evidence that new graduates holding a BSN are being highly sought by employers. The state’s acute care hospitals are especially focused on hiring BSN-prepared registered nurses. Research shows patient outcomes are improved and patient deaths reduced when the nursing staff holds a BSN. Our increasing complexity of technology, medications and treatments, and chronic health conditions underscores the need for nurses to continue their education. Coupled with the shift toward providing care in home-based settings instead of institutions, BSNs will be better equipped to meet this population’s needs. Advanced education and experience are required for nurses to serve as faculty in nursing education settings, which means that they have a BSN before pursing a master’s or doctoral degree. Lack of faculty prevents significant numbers of potential students from being admitted to nursing programs. The Governor’s Workforce Council has been exploring ways to not only increase the number of RNs but also increase the number of BSN registered nurses. This includes building more efficient academic and career pathways for associate degree nurses to advance to the BSN. 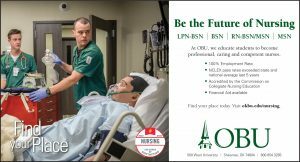 Fifty percent of the 2,375 RN graduates reported in the FY 2017 Oklahoma Board of Nursing Report are BSN graduates. Losing this group of new graduates would cause a huge strain on the nursing workforce in our state. Oklahoma is ranked 46th in the number of registered nurses per 100,000 people. Our nursing education programs already are stretched. 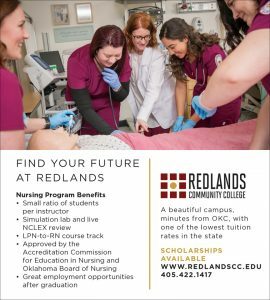 There are 15 BSN programs delivered on 25 campuses and 17 associate degree nursing programs delivered on 29 campuses. 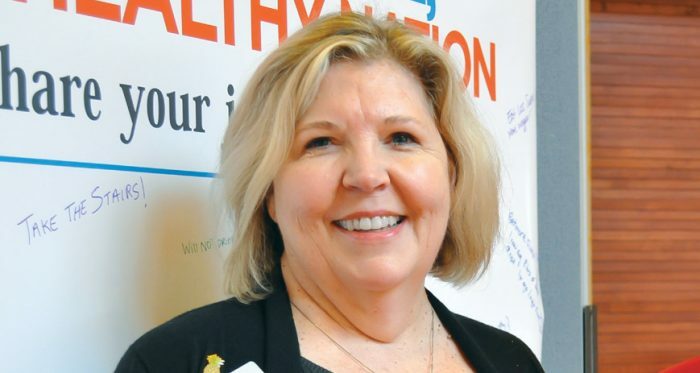 A number of national groups, including the U.S. Department of Health and Human Services, the National Advisory Council on Nurse Education and Practice, and the Institute of Medicine endorse increasing the number of BSN nurses to 80 percent. The Oklahoma Nurses Association supports these findings and supports a strategy to move associate degree nurses to BSNs. 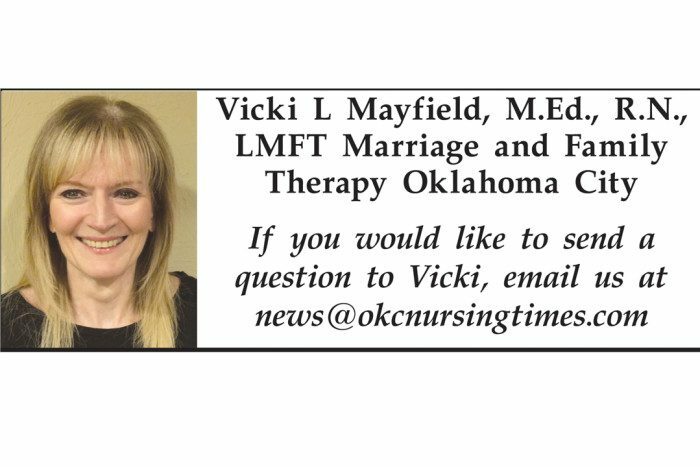 Associate degree-prepared RNs are important in Oklahoma, but let’s not get rid of our baccalaureate nurse programs just yet. Our state would be in dire straits with the elimination of these important education programs. Changing Lives for the better, together. It is what we do. And, it is who we are. Join us! At Hillcrest, our goal is to Change Lives for the better, together. Hillcrest Hospital – South provides state-of-the-art technology in an easy-to-navigate community setting. Our 180-bed facility offers a wide range of inpatient and outpatient services, including maternity, cardiology, emergency, orthopedics and surgery. Hillcrest Hospital – South is committed to evidence-based medicine and our results speak for themselves. 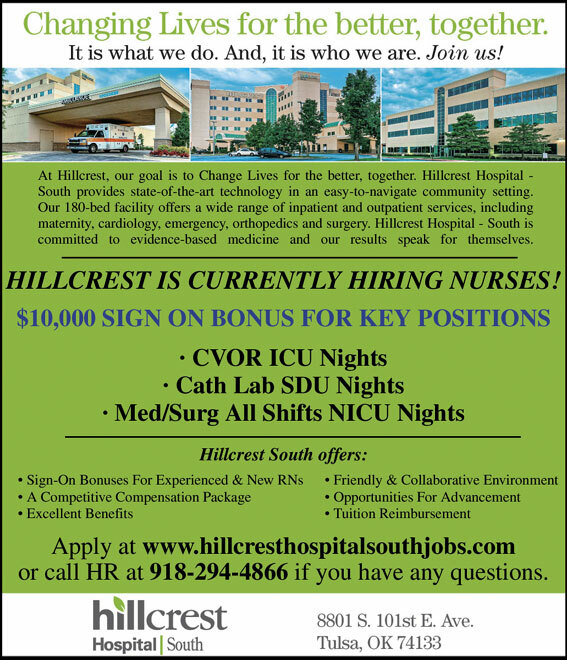 HILLCREST IS CURRENTLY HIRING NURSES! or call HR at 918-294-4866 if you have any questions. 8801 S. 101st East Ave.
ANOTHER KISS IS WHAT IT TAKES. ANOTHER KISS IS ALL YOU NEED. 1. RUN, don’t walk to the nearest 12 step Codependents Anonymous (CODA) meeting. 2. Find a therapist and begin some intense individual therapy. 3. Take “your addiction” recovery ONE DAY AT A TIME! 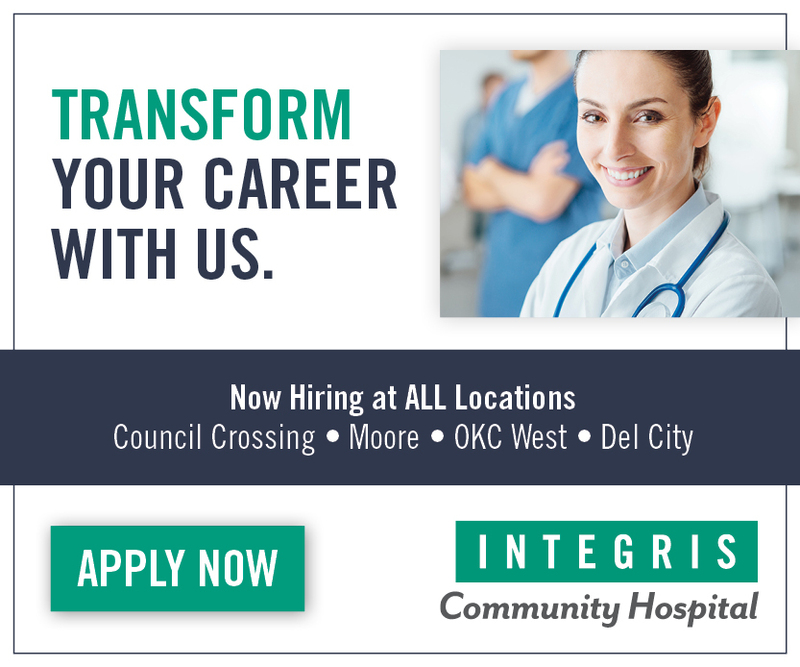 Join Oklahoma’s largest healthcare network. to excel in your profession. 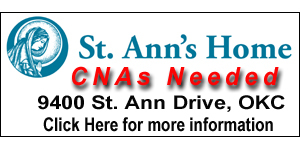 Explore nursing opportunities with Saint Francis Health System today. 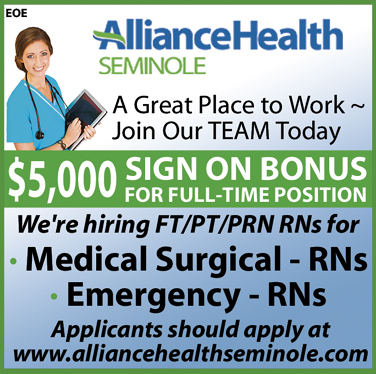 To view our current openings, please visit saintfrancis.com/nursing. 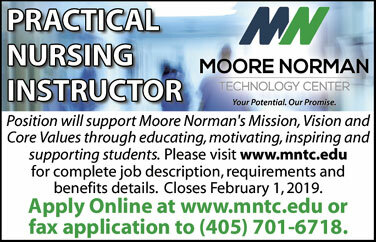 For more information, please call 918-502-8300 or toll-free 800-888-9553. Presbyterian Health Foundation made the year end holidays much brighter for the Coalition of Oklahoma Breastfeeding Advocates (COBA). The Oklahoma City based foundation granted $2,500 in funds to support COBA’s Baby Cafe, a nationally acclaimed, community-based breastfeeding support program offered in Oklahoma City. COBA’s Baby Cafe welcomes breastfeeding mothers and families semimonthly to receive support from trained lactation professionals free of charge. The gathering is café style; an open forum where mothers and families can share experiences and enjoy a healthy meal in a warm environment. For new mothers, the seemingly simple task of feeding their babies can be surprisingly difficult. While every major medical organization recommends full breastfeeding for at least one year, too many mothers do not have the support they need to overcome the challenges they encounter. In Oklahoma, women of color in particular face historical, cultural, and social barriers to breastfeeding. While 70% of minority women initiate breastfeeding, just 7% make it to six months. The same families that are most at risk to lose a child before his or her first birthday are also the families least likely to have the protection of breastfeeding to reduce that risk. COBA, also an Oklahoma City based nonprofit, is a volunteer driven organization working to improve the health and well being of Oklahoma’s infants and families. COBA launched Baby Café initially with grant funding from two national health organizations in 2014. As federal funding for this area of need ended, COBA began seeking other funding sources to support its sole Baby Cafe, and has plans to launch more locations in OKC and Tulsa. Funds donated to this program pay for professional lactation services, breastfeeding supplies, meeting space, and healthy meals. To celebrate the recent opening of its new location, COBA will host a Baby Café Grand Opening Celebration at Cole Community Center in Oklahoma City on Saturday, Feb. 2, from 12:00 p.m. to 2:00 p.m. This kid friendly, come and go event will also be COBA’s first meeting of the year. Refreshments will be provided, and all who support breastfeeding are welcome. Oklahoma Medical Research Foundation scientist Rheal Towner, Ph.D.
Glioblastoma is an aggressive form of brain cancer with no cure. Even with surgery and chemotherapy, patients typically live only 12-18 months after diagnosis. But a new discovery from Oklahoma Medical Research Foundation scientist Rheal Towner, Ph.D., offers new hope in fighting this deadly cancer, which claimed the lives of Sens. John McCain and Ted Kennedy. In pre-clinical experiments at OMRF, Towner discovered that a protein called ELTD1 is present in the most aggressive glioblastoma tumors. Towner then tested how the tumors would react to an antibody known to counteract the effects of ELTD1. He found that the compound slowed the process of angiogenesis, the growth of new blood vessels, which is key to tumors’ ability to spread and kill. The new findings were published in the journal NeuroOncology. Towner will continue to look for ways to use the new treatment in combination with other drugs to boost their effectiveness and better target tumors. 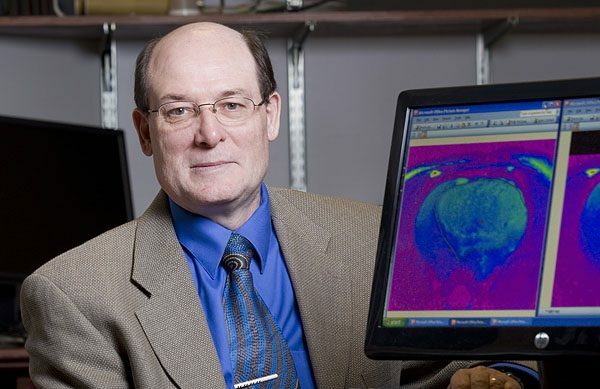 If researchers succeed with this tumor-targeting method, Towner said they will begin testing it on other tumors associated with breast, pancreatic or other cancers. Funding for this research was provided by National Institute of General Medical Sciences, grant number 5P20GM103636-02, and Institutional Development Award (IDeA) from the NIGMS, grant number 5P20GM103639. The NIGMS is part of the National Institutes of Health. Your one-stop resource for all of the breastfeeding basics. We will go over everything you need to know—from buying that first nursing bra to deciding when to wean. Attending class will allow expectant mothers to be more prepared for breastfeeding when baby is born. The class is free for mothers who will be delivering at AllianceHelath Midwest. The class is $10 for mothers who are planning to deliver elsewhere. Payment is due at time of class. Class will be: Saturday, February 9, 2019 from 1:00 PM – 4:00 PM (CST). There is no charge for the class. 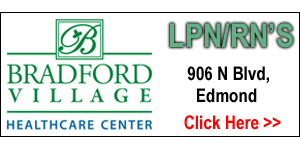 Class will be at Alliance Health Medical Group, 1800 South Douglas Boulevard in Midwest City. The 12th Annual Faith Community Nurses’ Association Conference title is “When Disaster Hits: The Role of the Faith Community.” The conference will educate the Faith Community Nurse and church leaders to organize and build capacity for the church to respond to local and regional disasters. Disaster is a “given” in Oklahoma. Faith Communities are affected directly and indirectly by these disasters. The message of Psalm 57, Have mercy on me, my God, have mercy on me, in you I take refuge. I will take refuge in the shadow of your wings until the disaster has passed, sets the stage for reflecting and mobilizing resources when disaster hits. This conference will provide resources, contacts and information needed to assist congregants during times of disaster and the opportunity for participants to network and to build relationships with nurses and health ministers interested in Faith Community Nursing. 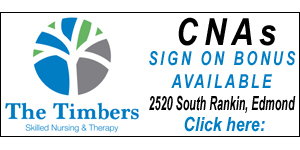 Registration for the one-day FCNA OK Member $60 for payments received before 2/8/19. 2/9-2/22 $85; 2/22 and later $105. Non FCNA OK Member $90 for payments received before 2/8/19. 2/8-2/22 $120; 2/22 and later $135. Nursing students $60. Clergy $65 for payments received before 2/16/18. 2/9-2/22 $90; 2/22 and later $110. Refunds before 2/8/19 less $20 deposit. No refunds after February 8, 2019. FCNA OK is approved as a provider of continuing nursing education by the Kansas State Board of Nursing. This course is approved for 8.25 contact hours applicable for APRN, RN, LPN, or LMHT relicensure. Kansas State Board of Nursing provider number LT0298-0316, KAR 60-7-107 (b)(3)(C). For registration and brochure, see the FCNA website, downloads page: www.fcnaok.org or register at www.surveymonkey.com/r/LNG3BBV and pay by www.PayPal.me/FCNAOK or contact fcnaok@gmail.com.